Our first taste of a Greek restaurant, and we wont rush back! Mike was astute in recognising we have not yet been to a Greek restaurant for dinner, and we agreed it was about time we tried it. A while ago, I had been given a card for this restaurant with a good feedback about the food. I was ready for a good evening, especially when the board outside advertised 3 course a la carte menu for £12.99 with a free glass of wine!! Fantastic......then you get inside and realise that in the menu in small print, it is only 12.30-2.30 pm. Such a shame as Gemma and I were impressed with the selection on the menu. As it was another Wednesday, the Osbourne road offers were in place. At Steki, you can get their Cypriot meze for £16 instead of the usual £26. Something Dean and I jumped to try!! Gemma and Mike decided to go with the regular menu, choosing Grilled octopus and patatokeftes as their starters. Mikes octopus went down extremely well, but Gemmas potato balls were unfortunately a little burnt. Dean and Clair had a range of starters including potato balls which were perfectly cooked, stuffed vine leaves, olives, pitta bread and dips, and salad as well as some Halloumi. rice, potatoes and salad. This was extremely filling, but the meatballs were very overpowering with the taste of tomatoes. Not really something Gemma admitted she would have ever again. The Cypriot meze offered kebabs (chicken and pork),soutzoukakia (but not the same as Gemmas), lamb steak, chips, rice, potatoes and salad. Again very filling and cooked well. It is a bit much with all the rice, chips and potatoes for our tastes, however. The decor was basic, although we did really like the stained glass window by the door. We were aware of how cramped the restaurant is with some strangely placed tables in the middle of walkways and by the door. Although the offers were on, the restaurant was not overly busy, as we had found with the steakhouse across the street, but there were some other customers all the same. It was the service that really put us off. Our waitresses were hovering constantly for empty plates, one of them even leaned over Dean as he was trying to eat to take a plate away! It made us feel very uneasy that we were constantly being hovered around, not pleasant at all! The toilets were small and cramped, not much to r=write home about. There was a little respite with the desserts....Mike tried the Galaktoboureko, which he enjoyed and Clairs Kormos was surprisingly tasty! So, lets get down to it................ the food was average to be honest. We were not wowed, but the Cypriot meze is definitely a good deal on a Wednesday. 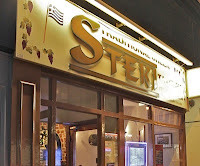 Steki is an ok restaurant if you want to go for an average meal. If you want to be wowed, i would avoid this one to be honest. The staff, although friendly, could do with a little more tact and training to avoid customers feeling uncomfortable. If this is what Greek cuisine is like, some of the group feel that they would not like to have it again!!! !